TNT Signs & Graphics LLC is a full service designer, producer and custom graphics manufacturer and installer of business, corporate, company, club, or organization vehicle wraps, signs, banners, magnetic signs, illuminated signs, cut out vinyl lettering, digital printing, yard signs, service sign repair, real estate signs, sign permit service, channel letters, and much more! 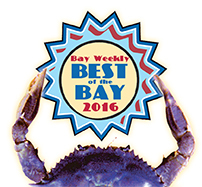 Huntingtown, Prince Frederick, Solomons Island, Dunkirk, Owings, Chesapeake Beach, North Beach, Sunderland, Lusby, St. Leonard, Deale, Shadyside, Edgewater, Davidsonville, Riva, Galesville, Friendship, Fairhaven, Rose Haven, Harwood, Lothian, Tracy's Landing, West River, Camp Springs, Capitol Heights, Upper Marlboro, Croom, Waldorf, Lexington Park, California, Mechanicsville. 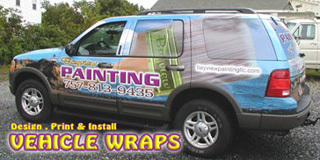 TNT Signs & Graphics LLC is a locally owned and operated vehicle wrap and graphic arts sign business located in the Washington DC area. Owned by Timothy & Tammie Wilhoit, TNT Signs has designed, fabricated and installed state of the art signs, faux painting, glass etching, artwork and graphics since 1992. 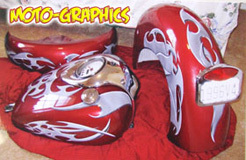 Since Timothy began his career before the advent of computerized graphics, we are able to offer the art of hand lettering and pin stripping in addition to custom graphics hand drawn or painted. If you do not see the service you need, call or email us!
" The airbrushed bike is awesome, thank you so much for your professionalism and adjusting to my schedule. I didn't think the bike could look any better after you painted it the first time, but you exceeded my expectations. Be assured that you will get all of my business in the future and I will definitely recommend you to other bike owners. " " Thank you for the wonderful, beautiful lettering job you did on the van. We are getting calls for new customers because of it. " " I'm sorry I missed you when you were here but I wanted to tell you the graphic looks GREAT! Our VP came down to inspect and said, we should get them to do the graphics on the other trucks!... just wanted to let you know it's a hit. Thanks for the quick turn-around. " " The sign is SO beautiful! Thank you so, so much! I could hardly believe it when I saw it. The sign is going to be of great value to us. " " I just wanted to say thank you for the wonderful banner, it turned out better than I could have imagined. Our family truly appreciates the hard work that the two of you do. I will continue to recommend TNT Signs and Graphics to anyone that will listen. " " Just wanted to say hello and thank you for the great design work on my car. I took it out in the sunshine yesterday to view the metallic paint effects and it looked awesome. I am very happy with how it turned out. " " The Yukon lettering looks awesome, much better than I imagined. Thank you very very much. You guys rock! " 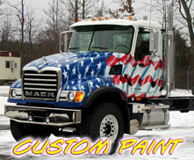 " Love my truck you guys so expertly wrapped! Still love it lots! Thanks!!!!!! "